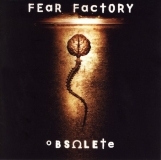 FEAR FACTORY - OBSOLETE (CD) | Online Shop | Wizard LTD.
Canada's Fear Factory is part of the '90s industrial metal scene that, unlike its Luddite '70s/'80s forebears, has no qualms about embracing technology (in this case, synths, programming and even a DJ) in the service of their dark, almost gothic vision. On OBSOLETE, the band owes much of its sound to thrash metal, with churning, gut-punching guitar riffs, sore-throat-from-hell vocals and an unrelentingly ominous mood. What separates Fear Factory from more traditionally inclined thrashers is their aforementioned incorporation of synths to help set the mood. Guest Rhys Fulber's keyboards function both as ambient pads to help establish atmosphere and as melodic elements, underscoring chord progressions. There's even a string section orchestrating the band's more melodic cuts. Look out for a spoken word appearance from electro-gloom godfather Gary Numan on the highly melodic title track. All Songs written by Fear Factory except "Edgecrusher" with DJ Zodiac and "Timelessness" by Burton C. Bell, Rhys Fulber & Dino Cazares only. DJ Zodiac - Scratching on "Edgecrusher"